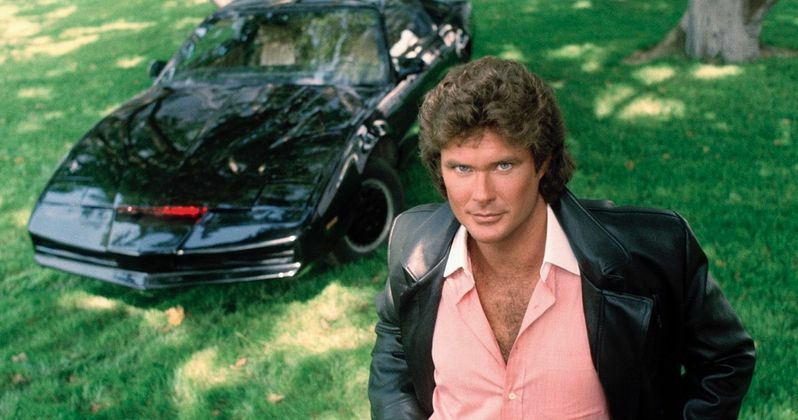 David Hasselhoff says to "stay tuned" when talking about a potential Knight Rider reboot series. The actor also revealed why talks to bring the iconic show back over a decade ago stalled and sputtered out. It seems that all of these years later, Hasselhoff has figured out why Knight Rider and Baywatch were so successful, and he's ready to get back behind the wheel to introduce his character and KITT to a whole new generation. In a new interview, David Hasselhoff was asked about the status of the Knight Rider reboot. Before discussing the reboot, he explained why the idea to bring the show back nearly a decade ago failed. Hasselhoff has a connection to the original series and he feels that he has an insight that nobody else has when it comes to doing the reboot justice. He explains. "We talked about another series about eight to nine years ago. But they wanted to do it without me. I wanted to tell them what the morals behind Knight Rider were, the morals behind Baywatch and why they worked!" After discussing why he has to be involved in the Knight Rider reboot, he mentioned that he didn't have to star and even pitched the idea of a cameo role. But, the studio decided against bringing the show back at all, even without Hasselhoff. When asked directly about the reboot finally happening now, all of these years later, Hasselhoff was able to offer a tease. He had this to say. "I'm not supposed to say anything, but stay tuned. The Knight Rider will ride again!" When discussing the popularity of the original Knight Rider series from the 1980s, David Hasselhoff says he was reminded about why that show, and Baywatch, resonated with so many people all over the world. It's unclear how or when the reboot will happen, but the actor seems more confident now than ever before that it's happening. As far as that reminder that he needed, Hasselhoff received it on his honeymoon last year. He explains. "I was on my honeymoon and this guy said to be 'You know why Knight Rider is so popular?' So I said 'Why?' He told me, 'You put your morals into Knight Rider and into Baywatch, that's why they are popular.' I thought, yes that's true! I don't need to be brave and fight like Knight Rider, or swim like in Baywatch. It's not that, it's about why they do it." Back in November, David Hasselhoff talked about the project and just said that it was in development at that time. But, he was talking about doing a Knight Rider movie. It is unclear if that is what's still happening, but it certainly seems that the actor is talking about a new TV series. Whatever the case may be, we should find out pretty soon if everything is going as well as Hasselhoff says that it is. The original interview with David Hasselhoff was conducted by Mirror U.K.